Earlier this season I stumbled upon a list of ‘alternative christmas movies’. As I expected, some of them we’d seen, and a few others were already on our list, but there were a couple films that had flown under our radar so far, either because we didn’t realize they were set at Christmas, or didn’t think that would be enough to qualify them as fodder for this project. This is one we’d never even heard of. Bell, Book and Candle is set at Christmas, all right, and Christmas and snow, decorations and music are enough of the setting to merit it a place here, but it’s so much more. This movie is about witches in New York. 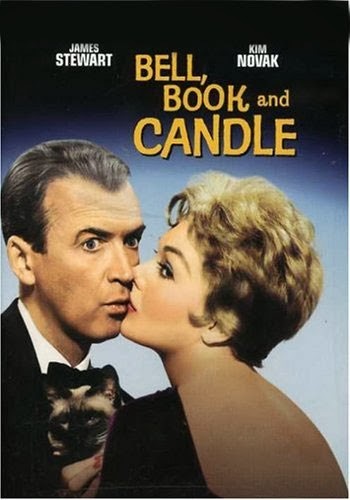 Kim Novak plays a witch who decides to seduce the guy upstairs (Jimmy Stewart) away from another woman with the help of a little magic and the assistance of her cat. Her friends in the magic community both help and hinder her as the relationship goes on. The movie has ups and downs: a few comedy bits with odd sound effect choices, a sequence or two that’s poorly paced, and a few scenes of Stewart being annoyingly obtuse. There is also some simply stunning filmmaking. There’s gorgeous lighting and costuming and fascinating characters. You have to be in the right mood to enjoy this movie, and you have to like this older style of romantic comedy-drama. We also need to talk about the ending. I was impressed, frankly. I was expecting the ‘powerful woman gives up her power to be with a man’ trope that I absolutely hate, but I got something that could be superficially read that way, but I found it a lot more nuanced. It’s not at all Bewitched; it is a bit Little Mermaid. There’s even a few different ways to read the final outcome. Just be aware going in that this was styled a romantic comedy, and while it would be more effective with a tragic ending, you’re not getting one. If you like romance and magic, kissing in the snow and beautiful filmmaking (not to mention the exquisite Ms. Novak), check this one out.